Iris (Kate Winslet), a London-based journalist, has just had her heart destroyed by her colleague Jasper, who she has longed after for many years, but he’s just got engaged to someone else. Meanwhile Amanda (Cameron Diaz), the owner of a hugely successful L.A. movie trailer company, has just discovered her boyfriend Ethan (Edward Burns) is cheating on her. Both women decide they need to get away from everything for a few weeks, so opt for a house swap, trading homes for a fortnight over the Christmas period. But when they had originally hoped to get away from love, they each end up finding it in the most unexpected of places. Marty (Colin Farrell) is an alcoholic writer (otherwise known as just a writer) who has the title of his latest screenplay – Seven Psychopaths – but is struggling for anything after that. His best friend Billy Bickle (Sam Rockwell) is desperate to help, and posts an advert in a newspaper, calling for any psychopathic characters to get in touch as inspiration. 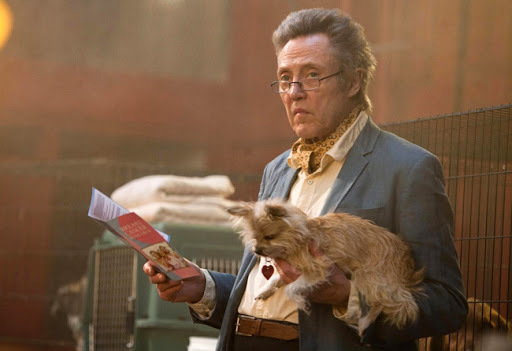 Meanwhile, Billy and Hans (Christopher Walken) run a dog-napping business, in which Billy ‘borrows’ the dogs from unsuspecting owners, only for Hans to return them a few days later and collect the reward. This all goes a little awry when Billy’s latest victim, Bonny the ShihTzu, is owned by ruthless mob boss Charlie (Woody Harrelson), and he really loves that dog. An alien ship lands in Washington D.C., and from it emerges Klaatu (Michael Rennie), a humanoid from a neighbouring planet, who brings with him a message he wishes to convey to the various leaders of Earth. When they squabble pettily over where the meeting should be held, Klaatu instead decides to meet with the general public, so he rents a room in a boarding house, under the name Mr. Carpenter. There he meets the other lodgers, including Helen (Patricia Neal) and her young space-obsessed son Bobby (Billy Gray), and eventually he meets with Professor Barnhardt (Sam Jaffe), a learned scientist, in the hopes of discovering something worthwhile about Earth and mankind. Oh, and one other thing. 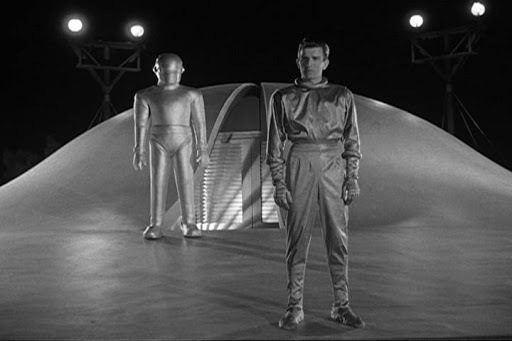 Klaatu has a giant, omnipotent robot guardian called Gort, who has an eye-laser capable of disintegrating anything. As a nerd, I like my science fiction, but I’ve never obsessed over it. I’m a fan of Star Wars, but I’m not a super fan, and the only Star Trek-related media I’ve seen is J. J. Abrams recent film. To be honest, Firefly has always been more my cup of tea, and that’s only science fiction in that its set in space, and that’s a similar situation here. The actual science fiction elements of The Day The Earth Stood Still are mere background details for a large section of the film, as it becomes almost a fish out of water tale of a man unfamiliar with his new surroundings, learning about a new culture, its eccentricities and foibles. Obviously there is still a great deal of the otherworldy – Klaatu is an alien after all, and there’s the robot capable of destroying worlds who is controlled by words and flashing lights – but the more memorable aspect is the social indictment; the message that we, as a civilisation, need to get our act together or suffer the consequences. It comes as no surprise that the film was remade in 2008 (though I’ve not yet seen it), as clearly had the events of this film actually taken place in 1951, then we certainly didn’t listen, as can be seen by the state of the world today. But I don’t want to get too political, so I’ll just say that message from the film back in the 50s, just six years after the end of the Second World War, is possibly just as relevant today. 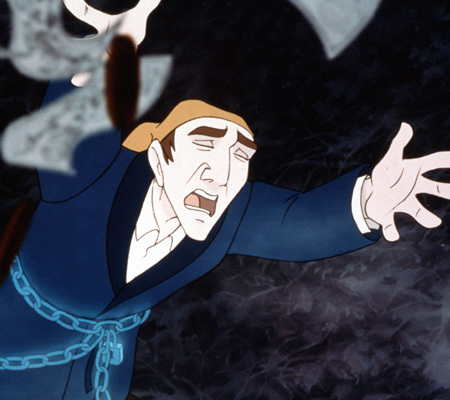 Anyway, the film. Seeing as it was made over 60 years ago, its no real shock to find that the special effects for the most part don’t really stand up. Gort is quite blatantly a man in a suit (Lock Martin, of whose nine screen roles six were uncredited and one was deleted), wires are fairly visible in some scenes and footage is clearly sped up to indicate people running away. The laser and disintegration scenes are ropey at best, but I was thoroughly captivated by the shots of the spacecraft opening, with a doorway appearing on its seamless surface, and disappearing again just as effortlessly. Michael Rennie seems perfectly cast as a creature not off this world, with his angular features, harsh cheekbones and a deliberate, considered approach to movement and speech making him seem passable for a human, but one who’s definitely a little… off. Which makes it something of a surprise when Helen has no qualms about leaving her son Bobby with this strange man she’s known for only a matter of hours as she goes gallanting off with her beau. There was a very high possibility of the kid becoming excruciatingly annoying – my girlfriend certainly thought he was – but I found his naivety endearing, even if he seemed far too respectful of his elders, in a manner unheard of today. The film’s cinematography was brilliant, especially the use of shadows and silhouettes, and the imagery of Gort carrying the figure of Helen, as made famous by the poster. Bernard Herrmann’s score is also suitable sweeping and atmospheric. It’s no surprise that this film has become an integral part of classic science fiction, with the phrase “Klaatu, barada, nichto” (or is it necktie?) going down in history as one of the greatest quotes in cinema. I’m intrigued to now see the remake (if only for John Cleese, an idol of mine), but public opinion has left it not very high on my to-watch list. Bletchley Park, 60 miles outside London during the Second World War. The Germans have just changed the codes they use for their military communications, so the English bring in Tom Jericho (Dougray Scott), their former code breaking prodigy who was the only one able to crack the codes last time around. The problem is, Jericho went a little bit insane after some business involving his former lover Claire (Saffron Burrows), who has recently disappeared. 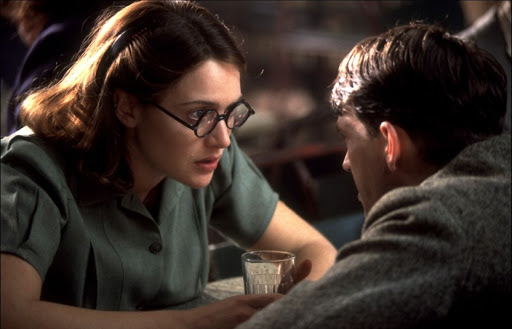 On top of all this, there’s a rumour of a mole inside Bletchley Park, and when Tom investigates Claire’s disappearance with her room mate Hester (Kate Winslet), Tom finds incriminating evidence that could point towards Claire being the culprit, and he even finds himself under suspicion. Oh, and of course he’s working against the clock, as there’s a flotilla of US supply ships heading directly towards a cluster of German U-boats, and only his code-cracking skills can possible save them. The story of a very poor family struggling to make ends meet in a Bengali village in the 1920s. Harihar (Kanu Bannerjee) must cope with looking after an elderly relative, kleptomaniacal daughter, carefree infant son and her clueless husband as he does his best to provide for a family that never seems to catch any breaks. There are many films in the 1001 list that, when watching, I can’t really see why they’ve been included, and it isn’t until afterwards (or during, if it’s really boring) when I read up on the film a little, that I discover there is some cultural significance or historical context within which the film can usually be appreciated as an achievement, but not necessarily enjoyed. Such is the case with Pather Panchali, for as I now know it is the first film of director Satyajit Ray, who would go on to direct various other films also included within the 1001 book: The Music Room, Aparajito and The World of Apu, with the latter two completing the Apu Trilogy, begun with this film. 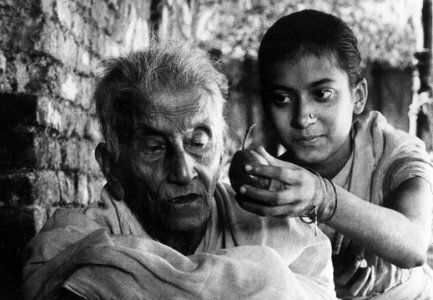 Pather Panchali also marks the first independent Indian film to garner international acclaim, so that at least answers the question of why it was in here. So what was wrong with it? Well, nothing really, it just didn’t really feature a great deal in terms of plot or anything to engage my attention. Its just a rather plodding depiction of an Indian family’s life, and the sporadic ups amidst mostly downs that they endure. There are some nice moments – the joy cracking across the wizened face of the elderly relative when Harihar’s daughter Durga gives her a guava stolen from the neighbour’s orchard, Durga and her younger brother Apu encountering a train – but once again I’m getting rather tired of watching depressing films. As such, I really don’t have that much to discuss about the film. The most annoying aspect of this film is that its the start of a trilogy, all of which appear on the 1001 list (and the Empire 5-star 500 List, for reasons that will hopefully become clear once I’ve seen the rest of the trilogy). Before watching, all I knew about Pather Panchali was that it was the start of this trilogy, titled the Apu Trilogy, so I was expecting it to be about someone called Apu. Therefore, once he was born, I expected him to be the central figure of the story, but was surprised when he was kept mostly to the sidelines. I’m sure he’ll become more prominent in the later films, but I’ll try not to anticipate that, just in case he doesn’t and I become even more disappointed later. Aparajito and The World of Apu are the next two films in my LoveFilm queue, so I should be getting to them fairly soon, as long as I can bring myself to actually watch them. In short, I’m chalking this film up alongside the likes of The Jazz Singer, Battleship Potemkin and Olympia as being a historical moment in cinema, but one that I’m not keen to repeat, and definitely cannot recommend.